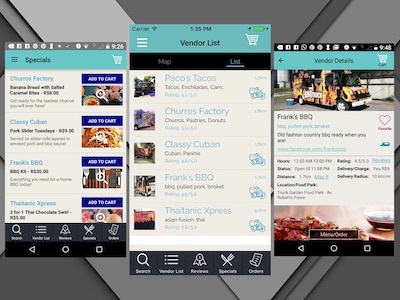 Street Food EZ (SFEZ) enables customers to quickly find, order, PAY, engage and review local food places. With multiple mobile POS/payment processing options, food park location enablers, ratings/reviews, express takeout/delivery, we are uniquely positioned to support food trucks, food carts, restaurants, etc. We are taking an old school “Fred Flintstone” approach, but with modern convenience.